Save $ April & May. You'll be about 100 yards from the most beautiful, award winning beaches in the United states, when you rent our getaway. As soon as you step into our condominium you'll know that you've picked the right place to relax and play. The spacious floor plan is on the 2nd floor of a three story building, where you'll enjoy great ocean and sunset views. *** Recently updated with New 43”TV (Netflix, Hulu, Pandora, Etc... capable), Blue Ray Player in kids room (Netflix, Hulu, Pandora, Etc... capable)... ALL NEW BEDS INSTALLED JULY 1, 2018!! Our unit has a master suite complete with a king-size bed, private bath, cable/TV, and access to the large covered porch. There is an additional full bath and 1/2 bath. Two more bedrooms, one with two queen-size beds (w/TV) and the other with two twin beds (with TV in kids room/Blue Ray). All linens are provided. The family room has a queen-size sofa sleeper, 40" Flat Panel, Blue Ray). The dining room seats six and the adjacent kitchen has three bar stools and is fully stocked with all of your cooking needs. The unit also has a stackable washer and dryer. Beachside Villas complex offers is a family oriented community, with two pools (one heated for winter use), lighted tennis courts and shuffleboard. There is also a biking/hiking path on adjacent Highway 30-A. Beach chairs and umbrellas are available for rental at the beach. 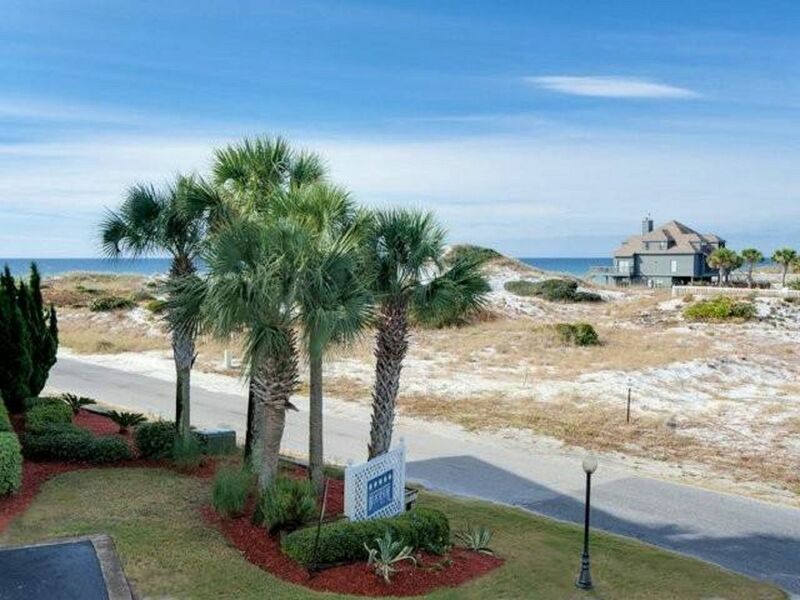 Beachside Villas is located between Destin and Panama City in very quiet area. Seaside Beach is just 5-10 minutes away and has lots of small, quaint shops and restaurants. Stay with us and you'll experience the natural beauty of Florida's Emerald Coast, where the white sand is like sugar and the Gulf waters are aquarium clear and emerald green. NO SMOKING allowed and NO PETS allowed. We are from the Kansas City Metor Area. We've owned this unit for 10+ years and are kids have grown up as beach kids and they love it. After searching for a week, we found BSV to be the most family oriented complex on 30A. It's also just steps the beach and very affordable! While not exactly 'beach front'.. It's a 3 minute 'toddler' walk to the beach through the breezeways. Up to two car/, you must register your vehicle and get parking tag upon checking in. Oversized kitchen with new appliances. BEACH CHAIRS AVAILABLE TO RENT AT A LOWER PRICE THAN RENTING DIRECTLY ON BEACH. ASK FOR DETAILS! The property and location were wonderful, although lacked some basics. Overall we really enjoyed our stay at the property. The white sand and beautiful water were everything we'd been told they would be! The only faults were in some basics; a few games (for rainy days), some basics in the kitchen such as salt/pepper, ketchup, mustard, etc. would have been helpful. The tile floors could have been cleaner and a few beach chairs and umbrella would have been nice for the beach. Also, the front right stove burner didn't work. Overall though, the unit was perfect for our family of five and the close proximity to the beach was great. Very comfortable and well equipped. Quite nice. Had a wonderful stay in December. Plenty of room for family to join us. Great location, price, and very spacious. We loved this condo. It’s about 3 min walk to the beach and the 2nd floor allows you a partial view of the gulf. Especially loved the layout of the rooms with 1 kids room directly across from the master for our 6 year old and the other room was at the other end of the condo which gave our teenage daughter some space. You are a 5 min drive from restaurants and Seaside. Located about 25-30 min from Destin or Panama City depending on which way you go. Would DEFINITELY stay here again! We stay in Seagrove every year, first time at these condos. The porch was my happy place, amazing views of the ocean and listening to the waves. The condos kitchen was well equipped with everything we needed to cook and bake while we were there. Liked being on a dead end street where we could ride bikes and take daily walks without a bunch of traffic. So glad you enjoyed your stay! We try and make sure our Condo is always ready for our guests. Beachside Villas is situated in the perfect location close enough to everything yet secluded and a little bit private! See you next time! Great unit. Second time staying at this unit. Nicely decorated. Walking distance to the beach. Thanks for the great review! Looking forward to your returning next year! LOVED it! We will be back! Very nice condo. Crystal Blue waters. Sugar white sand. Our family enjoyed our visit to Seagrove Beach and this condo was just perfect. Steps away from the beach and pool. Well equipped kitchen. Clean. Thank you for sharing it with us! We will be back! So glad you enjoyed our unit and our family friendly community. Remember we always offer a discount to repeat renters! Rates are subject to change until booking. Refund policy: Full refunds 90 days prior to arrival. Inside of 90 days, no refunds. Administrative fee includes damage waiver up to $1500.